Combining live action footage with a whole host of animation techniques, Israeli artists Tal Zagreba, Robert Moreno and Daniel Sasson bombastically champion the cause of 420 advocates everywhere, in their creativity packed music video for Hadag Nahash and Infected Mushroom’s legalisation anthem Legal Eyes. In keeping with the grand ambitions of this multi-media opus, DN invite all three creators to provide their perspectives on the challenges they had to surmount in order to deliver this haze infused promo. Hadag Nahash and Infected Mushroom are two of my favorite Israeli bands (since I was a teenager). Therefore, I was so thrilled when in March 2015 they asked me to make them a music video for their legalization anthem: Legal Eyes. After listening to the song over and over again, I felt that I wanted to create an epic music video about an enchanted world that derives from marijuana coming to life in a little ordinary apartment. I thought it would be amazing to combine live action footage with classic animation and stop motion animation – so the visual effect would be magical. The two bands loved the concept and asked to see a full script and a motion test for the combined-animation technique. In order to do so I contacted Robert Moreno, an amazing animator whose work I loved, and presented the idea to him. Robert really liked it and started working on the test – trying to figure out how we could pull all those animation techniques together. In August 2015, after the bands approved the script, the test and the budget – we got a green light to make the video. Robert recommended Daniel Sasson, a super talented stop-motion artist who studied with him at the Bezalel Academy of Arts. Daniel happily agreed to join the gang, and we started working together on the storyboard for the music video. We needed a producer and a DOP for the live action part – so we recruited our friends Aviv Shiloh as the Producer and Eric Raphael Mizrahi (the DOP of the Oscar nominated short Ave Maria) as the DOP. Once the team was completed we were ready to rumble. In November 2015 we had 3 live-action shooting days using Aviv Shiloh’s Red Dragon camera. During those shooting days we shot many sets in the apartment – which would function as backgrounds for the animation to come in the future. After the shooting days, Robert began working on the classic animation and Daniel started making the stop-motion animation. When we finished gathering the live-action and stop-motion footage we began cleaning the green screens (a lot of rotoscoping and masking work). On the next phase we assembled every stop-motion shot with some live-action apartment footage using the Adobe After Effects software, and added some light and shades (so it would look organic to the space). On top of the composited result we drew classic animation for the personification of the items (for example: the nails vs. the matches) – and finally colored every shot so it would look homogeneous. Another challenge was to create stop-motion animation that would align with the live footage angles, and make both feel like they were shot at the same place. What I liked about Tal’s pitch was that he wasn’t afraid of going crazy, he had a vision of mixing all these crazy ideas in different media and he asked if we could pull it off. I myself like challenges and had no idea how we could do it but I didn’t want to limit us with the know how and tried to get out of our comfort zone so I said “yeah sure, why not, we can do that”. 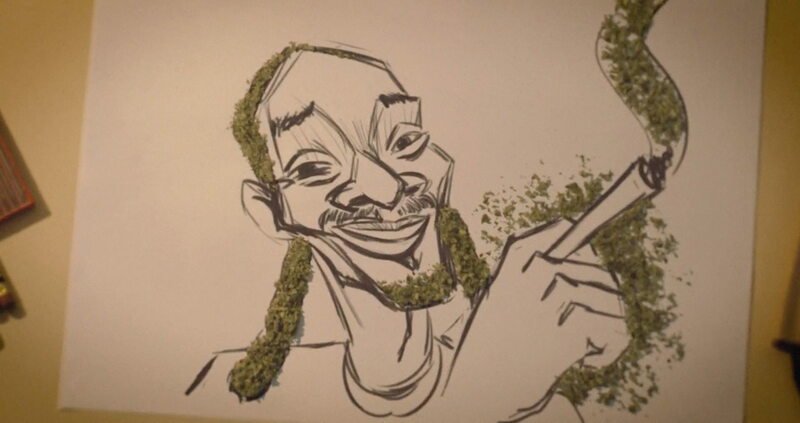 The first part of the music video (the marijuana stop-motion on paper) ended up being very difficult because we had to fake a very long one shot – that contained a lot of motion, animation and camera movements in several dimensions, as we wanted a very organic feel of camera movement instead of the usual stop-motion steady shots or stop-motion animated movement of the camera – so that was a challenge. We had to plan the live action shots carefully as they were shot handheld and the movements couldn’t be too drastic as we needed to 3D track the footage and then also to compose stop-motion on top of it, as opposed to 3D we could break the illusion easily if we took it too far. For the animated weed first we did a classical animated version – then we used it as a guide for the whole scene; afterwards, we did the marijuana stop motion animation on a white paper according to the drawn version; to finish the shot we had to tie up the hand drawn animation and to erase unnecessary lines – and finally to compose everything together; the live action, stop-motion paper animation, hand drawn and the stop-motion weed animation. We also had some scenes that required a complicated assembly of stop-motion in 3D space with a lot of camera movements (for example: the helicopter that shoots on the table) – where we used 3D camera projection so that the elements on the table that were shot separately in stop-motion on a fixed rig wouldn’t lose they’re 3D qualities. For the many matches and nails fighting we did different versions of single fights and in that scene we used particle systems to randomly place them around the table as they were many, kind of a cheap version of crowd simulation – for the explosions we shot loose paper and broken matches explosions in live action (that we shot earlier on a black background with the Red Dragon camera in slow motion). A big challenge was compositing in general as we couldn’t afford to do the stop-motion animation on the live action set and had to do it separately at Daniel’s studio. We took reference pictures of how the light behaved and how the objects were placed so that Daniel could set up his lights and camera accordingly to the live action shots – which was an enormous challenge for him and then for us both to composite and stitch everything back together. Thanks to Tal, Daniel and Robert for the insight into their process. You can watch it all come together in following Behind The Scenes video.